HORSE RACING: The Noorama Picnic Races hit the ground running for 2019 - complete with a photo finish, fresh faces both in the crowd and on the track and a spectacular fashions on the field. 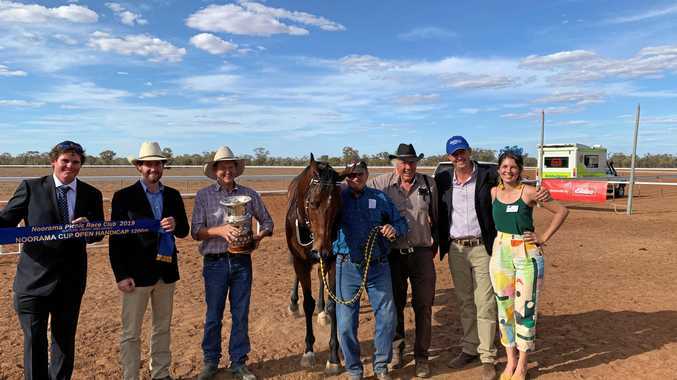 It was another day in paradise, despite the dust and flies, as the Cunnamulla district and visitors came out for a day of fun at the beautiful new facilities at the Noorama Race Course. Noorama Picnic Race Club secretary Andrea McKenzie said the racing was riveting, recalling a trainer from Charleville remarking he'd just seen "one of the best straights in racing - it doesn't get much better than that”. "There were plenty of cheers around the TV too as the crowd watched Winx run her fine form one last time, and some very happy punters when Gadfly, trained by Mark Ward of Condobolin, took home the Waters, Henry and Davey Noorama Cup Open Handicap,” she said. "The gelding was ridden well by the day's Most Successful Jockey, Michael Heagney, who took home three firsts of the five race card. Noorama Picnic Racecourse facility upgrades were made possible dure to the teamwork of the Paroo Shire Council, Gambling Community Benefit Fund, Rural Aid, Buy a Bale and Racing Queensland.